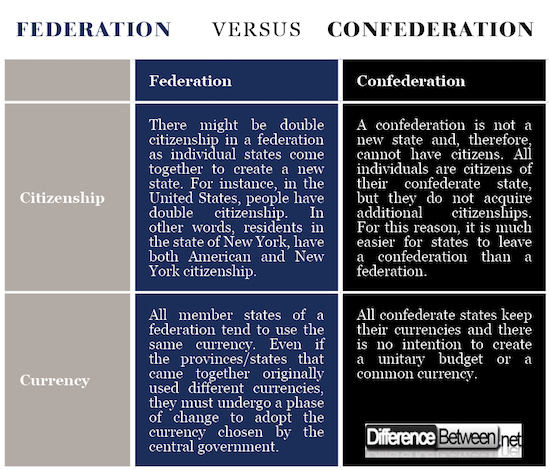 The terms federation and confederation refer to similar – yet very different – concepts. In a confederation, states come together creating a loose (often temporary) union for matters of political, economic or administrative convenience. Within a confederation, member states maintain their sovereignty and often appoint a weak central authority to speed up bureaucratic matters. Conversely, states or provinces that join a federation, agree to give up part of their powers and to answer to the central government, which has the power to enforce laws and regulations. In both cases, we are talking about a union of countries, states or provinces, but members of the confederation maintain a large degree of autonomy and independence – and can (almost) freely leave the union when they decide to do so – while members of a federation are bound to respect the authority of the central government and maintain limited powers. In addition, the central government can interfere on the legal and economic aspects of the member states/provinces. Policies and regulations approved by the central government apply to the federation members – in line with the provisions laid out in the constitution – and constituents are legally bound to respect such regulations. Federations are quite common today: the United States, Canada and Switzerland are just few of the most notorious examples, although Switzerland retained the title “confederation” (Confederatio Helvetica) even after becoming a federation. In the United States, the federation is formed of 50 individual states, while in Canada and Switzerland provinces are tied together under the umbrella of the central government. 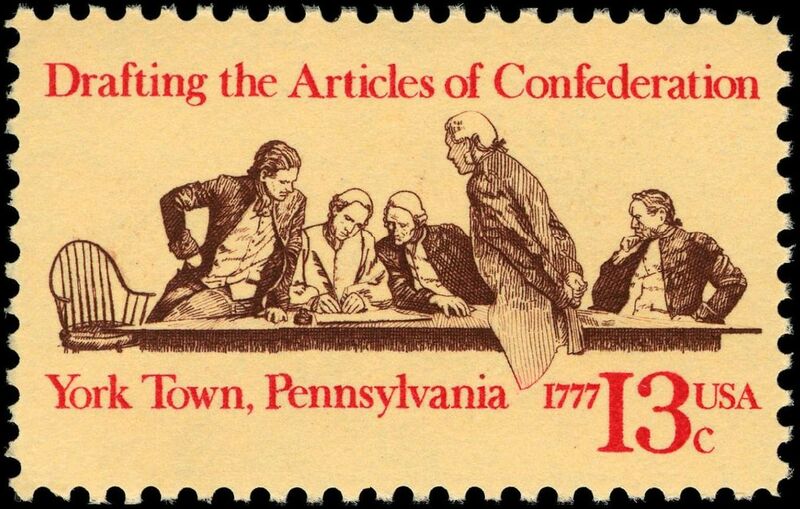 The United States started as confederation and later turned into a federation once the constitution was created, signed and ratified by all members. The concept of confederation is similar to the principles on which international organizations stand. For instance, the European Union has similar structure, even though it is not officially defined as such, in particular because there are legally binding documents that prevent states to enter and exit the union as they please. The European Union is formed of various countries that willingly decided to give up part of their independence – but still maintaining their sovereignty – in order to create an international body and present a united front on the international scale. All international governmental organizations – like the United Nations – follow the concept of confederation. States decide to create a union, but maintain their power and are only subject to international laws and norms if they decide to ratify treaties and covenants. In both cases, being part of the federation or the confederation should benefit member states. In the first case, constituents give up part of their sovereignty in order to receive protection, security and economic or political advantages. In the second case, states and provinces enter the confederation to create a stronger entity and enjoy administrative and economic advantages without losing power or authority. The ties among states and provinces are much stronger in the case of the federation. Indeed, in a confederation, states agree to come together for various purposes, but they are not legally tied together and can technically back up or exit the confederation whenever they want (depending on the type of confederation). Conversely, in a federation, there are binding legal agreements that prevent states from leaving the union. Relations among states within a federation are stronger as the different entities come together to create a new nation state. Being part of a federation or a confederation has different implications for member states. In the first case, the constituents give up part of their power and sovereignty – while maintaining the ability of taking some independent decisions – while in the second case, individual states maintain control over their territories and citizens. Building on the differences outlined in the previous section, we can identify few other aspects that differentiate the two political systems. Confederation and federation are two government systems in which states or provinces come together for political, economic, social, or security reasons. Even though they are often confused, they are quite different. In a confederation there is no new central government and constituents maintain their autonomy, independence and sovereignty. Conversely, members of a federation are subject to laws and regulations created by the federal government, although they maintain a certain degree of autonomy. Today, the number of existing confederations is limited, while the number of federations is quite high. The main difference between the two is the constitution (absent in the case of a confederation), which creates legal ties among member states and sets the balance of power between central and local authorities. Giulia Squadrin. "Difference Between Federation and Confederation ." DifferenceBetween.net. March 26, 2018 < http://www.differencebetween.net/miscellaneous/politics/difference-between-federation-and-confederation/ >. I love this website so dearly with respect to academy study. I want to continue my advance study from here. I understood the difference between the federal and confederal states. the only thing I want to know is the authorities of each regarding exchanging diplomatic and consular missions. thank you so much in advance! Blankart, Charles B. "The European Union: confederation, federation or association of compound states?." Constitutional Political Economy 18.2 (2007): 99-106. Burgess, Michael. "A conceptual reappraisal of federalism, federation, confederation and federal political system." Routledge Handbook of Regionalism & Federalism (2013): 1696. Fischer, Joschka. 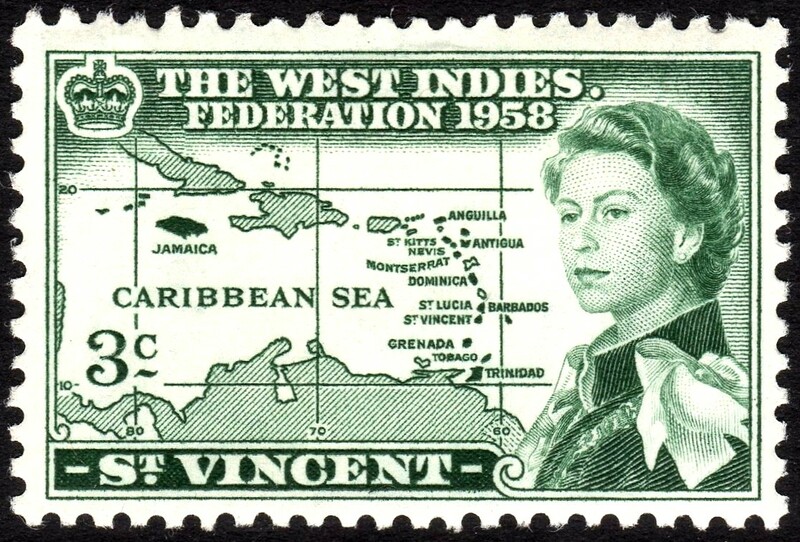 "From Confederation to Federation." Quo vadis Europa (2000).